Any chance we get to run ebuggy on the bigger track? Hopefully we're racing the big track. Don't call me a Cracker. The correct term is Saltine American. Is there racing this Saturday? Just asking since the Norcal Champs race is going on too. loved the meatball sandwich , witch was well ..............commin' on strong for the main to say the least lol ,no wonder why donnie always has that smirk on his face ..friqin' CROP DUSTIN"
should have my 3rd. 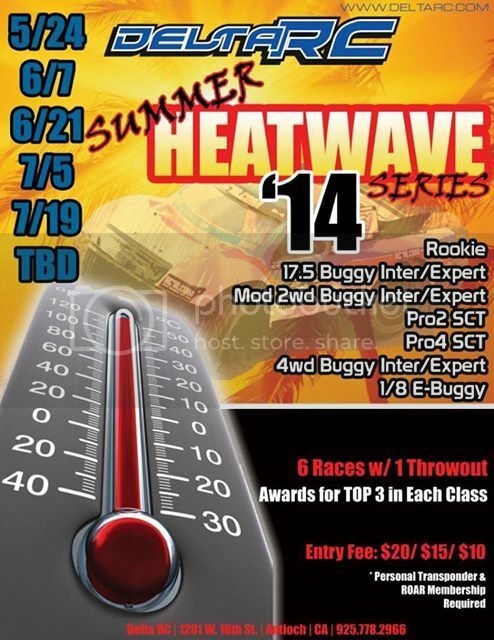 class (17.5 buggy) up and runnin' this week for next round of points series. Want to extend a big thank you to all you guys who bought food and supported my daughter Jordyn last night. They sold out on sandwiches and polish dogs. Racing was intense and the track was awesome. Hey Big J, you gave me a CVD the last time I was at Delta that fit my XRAY. What car was that from? I bought a set of Losi 22 CVD's thinking they would fit but they are too long. Not a complete waste, I'll give them to you the next time I'm in Antioch. Heads up!! track will be open for practice at 2pm today. The store will open at 4pm. Just a quick heads up, my wife and daughters will be there this Saturday night serving dinner to raise money for my oldest to go to camp. Looks like meatball subs and polish dogs, chips, energy drinks and maybe some desserts. Thx in advance for the support. I'm on for two and four wheel mod. Should be a great race night! count me in for Wheeler.. fo sho..